UnlockBase unlocks more phones from more cellphone providers around the world than any other online remote unlock website. We’re known to thousands of satisfied customers for our efficiency, our speed of response and our fair, cost effective pricing, – so much so that we won’t be beaten on price. If you can find an unlock deal online for the exact same phone model and service provider that is better than what we are offering, we guaranteed to match it or better it. One of the latest smartphones we can unlock for customers using MetroPCS as their service provider is the popular LG K7 from South Korean company LG. It’s the younger brother of the more powerful K10. Making its debut this month at CES in Las Vegas, it’s not surprising the K7 is expected to be such a popular choice. That’s because this smartphone is the complete package. With this phone you can tap into both your creative and practical sides and enjoy a great experience either way. It has outstanding camera features, and solid, speedy performance at a price that truly won’t break the bank. The LG K7 MS330, (or LG Tribute 5 as it is also known by some service providers), is a value for money Android phone with a slim arched screen and sleek back cover. Its 5-inch display is contained within a smart looking plastic design with a matte finish. MetroPCS will offer this phone as a pre-paid deal with an affordable price tag. In fact, the phone brand new costs $129.90, but with an after mail-in rebate you can have one shipped to you for just $49.00 online at MetroPCS. LG like to describe their K Series as ‘glossy pebble design language’, so called due to the curved, modern finish of the phones, aimed squarely at a younger audience without a lot of budget to blow on a high-end smartphone. LG claim the design cues of the phone are borrowed from nature, and the phone certainly punches above its weight in terms of cost vs performance and looks. The LG K7 is a 5-inch 854×480 resolution smartphone. It’s running on Android 5.1 Lollipop along with LG’s Optimus UI on top. It’s powered by a 1.3GHz quad-core processor, with 1GB or 1.5GB of RAM and 8GB of storage inside. There’s a microSD card slot inside, which can support an upgrade of up to 64GB of storage as well. LG has packed an 8MP camera in the back with a surprisingly good quality 5MP camera in the front. The phone is equipped with LG’s easy to use photo technology including Gesture Shot and Gesture Interval Shot, making the taking of selfies easy and hassle-free. With Gesture Shot you can take photos simply by raising an open hand in front of the lens and then clenching it into a fist. When you close your hand twice the camera automatically goes into Gesture Interval Shot mode whereby it will run off four consecutive photos. There is also Flash for Selfie on the front to help capture moments on the fly, whenever, wherever the moment presents itself, even if it’s in the dark. The phone is powered by an 2125mAh battery that is non-removable, and therefore non-replaceable. 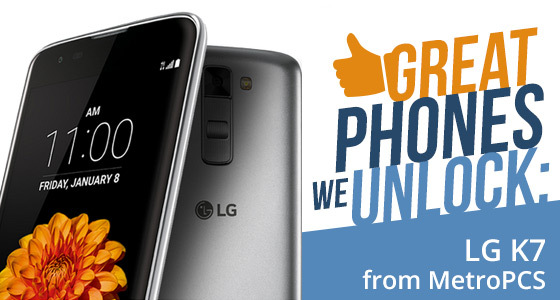 Our new, easy to use MetroPCS Android Mobile Device Unlock App supports the LG K7 and the app can be yours for just $24.oo. Full step by step instructions are supplied and if you get stuck and you’re not sure what to do, our team are on hand 24/7 to answer your questions and sort out any possible problems. You can buy the app in seconds on the site and have your phone unlocked within just a few minutes, but don’t take our word for it, before you buy check out some of our genuine testimonials from satisfied customers.